NOTIFICATION: North Eastern Railway (NER), Gorakhpur, Railway Recruitment Cell (RRC) invites of line applications from Indian Nationals who are Ex –Servicemen for the recruitment of 273 vacancies of track man / Gang Man/ Points Man/ Helper-II / Khalasi and other posts. Eligible & interested candidates can apply through prescribed application format downloaded from official website up to 03-09-2013. Candidates can download detail advt /notification from official website for recruitment information like required age/ reservation in age/ required education qualification/ required application fee/ reservation for posts/ syllabus/ date of test/last date to apply/number of posts/name of department/ mode of selection/ how to apply and other instructions. POST WISE DETAILS: 273 vacant posts of Track Man, Points Man and Helpers in Indian Railway. 1. Track Man / Gangman. REQUIRED AGE: 33 years -38 years as on 01-01-2014. AGE RELAXATION: Applicable as per Govt. rules. REQUIRED QUALIFICATIONS: An Ex –Servicemen holding army class-1 certificate or its equivalent from other services and are metric passed from any recognized board. Ex-servicemen who have retired after completion of 15 years of services in armed force of the Union of India and have passed army first class certificate. PAY SCALE: Rs.5200/-20200/- + Grade Pay Rs. 1800/-. SELECTION PROCEDURE: Selection based on the merit of service records in army/ medical fitness and vacancies. “The Assistant Personnel Officer/ Recruitment, Railway Recruitment Cell, N. E. Railway, CCM Annexe Building, Railway Road No. 14, Gorakhpur (UP) - 273012”. 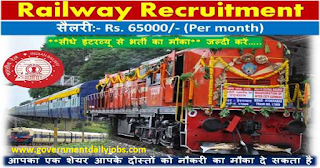 CONTACT ADDRESS: (Government of India / Ministry of Railways) North Eastern Railway (NER), Railway Recruitment Cell (RRC), Annexe Building, Railway Road No. 14, Gorakhpur (UP) – 273013. LAST DATE TO APPLY: 03-09-2013/18-09-2013 for the candidates from far-flung areas. OROP - Know your New Pension as per 7th CPC with arrears w.e.f. 01-01-2016 for Pre 2016. Subject: Implementation of ‘One Rank One Pension’ to Defence pensioners.